Guest DJ José Feliciano Is An Alt.Latino Icon : Alt.Latino Feliciano discusses his career as a crossover pioneer on this week's show and he plays the music that influenced his career — and it's not what you think. 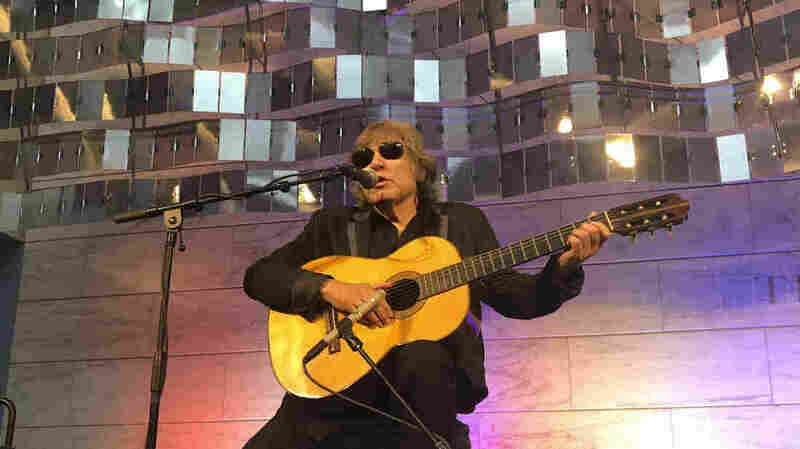 Grammy Award-winning artist Jose Feliciano performs the "Star-Spangled Banner" at the Smithsonian' National Museum of American History. For those that don't know their Latin music history as well as they should, it's easy to write off José Feliciano as just the guy who wrote and sang that Christmas song "Feliz Navidad." Maybe they'd be aware that he also wrote and performed the theme song to 1970's NBC sitcom Chico and the Man. But for every Cardi B and J Balvin racking up so-called crossover successes, it was Feliciano who paved the way for them back in the late 1960's. Feliciano was a blind Puerto Rican-born 'folkie' singing acoustic the guitar based folk music popular in the 60's. During a trip to Buenas Aires he did a one-off of classic boleros in Spanish and fought his record company to release it. Once they did, it became a hit so he recorded a few more Spanish language albums. Then a funny thing happened, Feliciano's 1968 English language album, called simply Feliciano!, produced English language hits with his covers of The Doors' "Light My Fire" and The Mamas & The Papas' "California Dreamin'". In both English and Spanish, Feliciano's bi-cultural upbringing was never far from the surface. He bent notes like a blues guitarist in boleros and slipped in Spanglish at the end of "Light My Fire." And yet, he rarely gets credit for crossing those lines and making the mainstream take notice of Latino culture during a time when the civil rights movement was still in bloom. So this week, we cover all of that and more as Feliciano takes his turn as a Guest DJ for Alt. Latino. In fact, we are elevating him to "Alt.Latino Icon" status to reflect his contributions and the roads he paved when it wasn't easy. We are hardly the first to acknowledge these achievements but we definitely don't want to miss out on the opportunity to do our own tribute.